In Chapter 26, Goal: Encourage Play, of The 30 Goals for Teachers, I talk about the importance of play for our learning, development, creativity, and mental wellness. With so much standardized testing and stress on data, play is being taken away. Children are being tested as early as Kindergarten. February 3rd is Global Play Day (#GSPD2016) and you can participate by getting your learners to play. 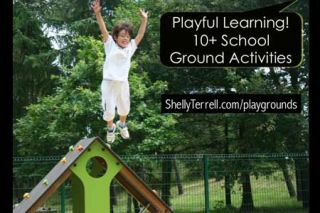 If the weather is bad or you don’t have the time, then strive to have your learners play outdoors a few times this year. Play is important for all ages. Below is a slide presentation full of ideas for getting your students to learn and play. Scroll down to access the bookmarks. Host outdoor board game challenges! Play sports! Host a field day, an Olympics games day, or teach them different sports popular in other countries, like curling. Students can works in groups to invent a sport. They decide the equipment, create the rules, then teach it to the class. They can take what they learn and apply it into building their own playgrounds. You can have local engineers and contractors mentor them. Have fun learning with chalk! Learners can draw vocabulary their peers guess, create positive messages around the school then interview students the next day to determine the impact, learn math with hopscotch, or sketch out math word problems. Geocaching is where you find little treasures around the area people create. Others find it through free apps that list hints, the longitude, and latitude. Do a school version where students hide small containers of treasure and their peers find them via their longitude and latitude. Play and learn with a ball! Play ball Q&A where students catch a ball and answer questions. If the students doesn’t know the answer he/she can throw the ball to another peer. Stick masking tape strips with icebreaker questions on a ball. Students catch the ball and answer the question touched. Then that students throws the ball to a peer. Makerspaces, learning stations, and genius hour projects allow students to explore hands-on and create. Send them on field research. In Texas, I’d take my students collecting water samples with SAWS engineers, bird watching with park rangers, fossil hunting with a paleontologist, and so forth. Take them on walks exploring the nature around them.They can create digital books classifying rocks, identifying bugs, naming plants and potential uses, or capturing the sounds of various birds. Go on a scavenger hunt! Try these apps and web tools- KlikaKlu app, Goose Chase app, QRWild.com, and the Qr Treasure Hunt Generator. Send them on photo challenges. Get them taking pictures of fractions, vocabulary, etc. Give them digital badges for completing these challenges. Send them on an epic selfie adventure! Find a free template I created that your learners can adapt here. Challenge: Participate in Global School Day and/or get students to learn by playing!